The EIPL nuclear, biological and chemical filtration system (NBC) provides clean filtered fresh air, free from NBC contaminates in an over pressure shelter. Three levels of filtration (coalescer, dust, and composite filtration) is applied to incoming air before being supplied to the shelter. The over pressure shelter removes the need for occupants to wear gas masks and protective clothing during NBC attacks. Two modes of operation allows clean fresh air to be supplied during peace time, or conventional combat times, and filtered fresh air during NBC warfare. The control system constantly compares inside and outside pressures, and should the cabin pressurization fail, provide a visual and/or audible warning. The NBC filter unit is designed for external installation to shelters with a supply duct to the shelter interior. The NBC control unit is designed to be installed internally within the shelter covering the air duct to diffuse air entering the shelter. When the NBC filter unit is operational the unit is designed as a fail safe system, i.e. should the unit sustain damage or an air seal leak, then clean air will leak out of the unit rather than contaminated air being drawn in. A pressure relief valve, is provided with the NBC pack. This precalibrated component maintains the compartment overpressure to a maximum of 200pa. The EIPL NBC filter unit operates with an airflow of 100m3/hr, this increases the NBC filter life by a factor of 1.7 from that stated below. 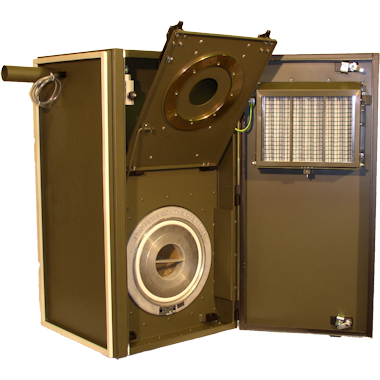 The filter comprises of two concentric elements; an Ultra High Efficiency (UHE) particulate element; and a charcoal anti-vapour filter, both contained within a cylindrical housing. Although the airflow is radial through the beds, the inlet and outlet are axial. When used in a positive pressure plennum (ie. surrounded by air that has already been cleaned) all seals made during installation become fail-safe. All filters are tested during manufacture for particulate abd gas penetration, thus in effect testing the integrity of sealing inside the filter as well as the filter elements. Current production version is the Mk2 (FV2171110, NSN 4240-99-830-5026). A Mk4 version (FV2148120, NSN 4740-99-839-9842) is to be introduced shortly. The Mk4 differs from the Mk2 in that it is made using an improved filling technique, has a more stringent vapour penetration test during manufacture and is supplied packaged for 10 year storage. In practice Mk2’s manufactured are now made to Mk4 standards, except that they are built for relatively immediate use, they do not use the 10 year packaging system.